I recently joined the Weight Watchers program to try it out, having heard alot of good things about it from people I know over the years. This is only my second week and I'm still a newbie but I've found that their plan has been easy to follow and does not cause me to feel deprived. I've lost a few pounds in my first week and I'm very pleased overall with my progress and how I feel. Since I prefer to cook at home, I'll be sharing recipes that are WW friendly from now on. 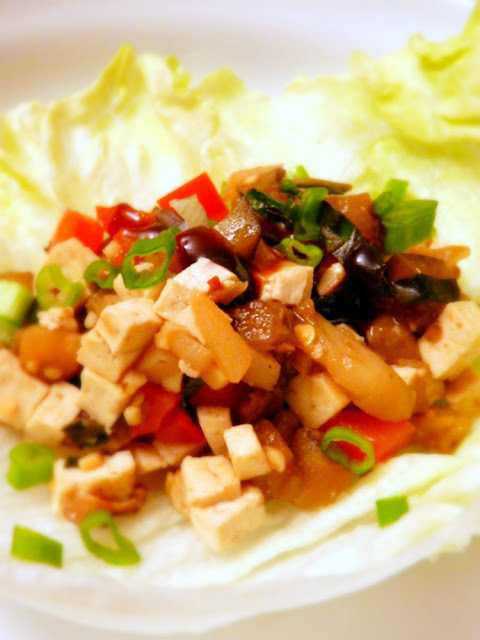 I made this veggie and tofu lettuce wrap tonight for dinner and it turned out to be so delicious. The kids enjoyed it immensely, especially in putting their own wraps together. To make it even more filling, you can add abit of brown rice to your wraps. Just be sure to factor in the WW points for the brown rice too! Makes 6 servings; roughly 2 to 3 wraps per serving depending on how large you make it. Heat the vegetable oil in a large skillet or wok over medium-high heat. Add the minced garlic and saute for a minute. Stir the garlic frequently so that it does not burn. Add the mushrooms and saute for another minute. Add the eggplant, red bell pepper and water chestnuts. Stir fry for about 3 minutes, or until the eggplant has softened. Add the oyster sauce, water, basil and tofu. 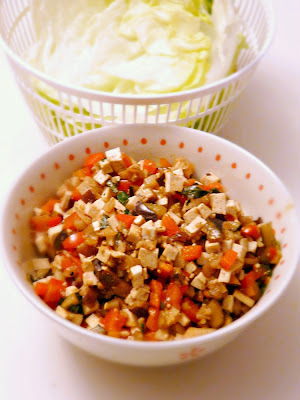 Continue to stir fry until the ingredients have been coated by the sauce and the tofu is cooked through. 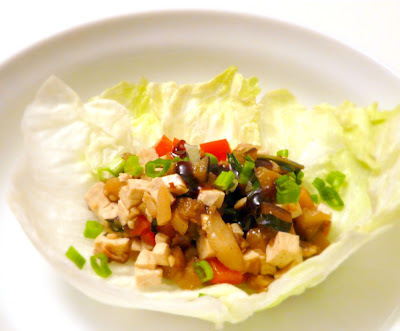 Serve with the lettuce leaves. Top with chopped scallions and a small dollop of Hoisin sauce if you so desire.